TOWCESTER TAXI AIRPORT TRANSFERS 01908 263263 RELIABLE ROAD TAXI TRANSPORT: Remember Walls Have Ears...And The TfLTPH Twitter Police Are Listening In. Remember Walls Have Ears...And The TfLTPH Twitter Police Are Listening In. Taxi leaks has known for some time that everything we say on social media is closely monitored by TfLTPH. Going back to 2011, our editor Jim Thomas, received an email (still in his possession) from John Mason, on which he'd forgotten to redact the attached train. Further along the line was a communication from his assistant Helen Chapman, who had been spying on Jim and attached screen shots from Twitter and the London Taxi Drivers forum of virtually everything he'd posted the previous day. (Reason for this was John Mason had in fact been blocked by the Forum and most of the drivers on Twitter). At Taxi Leaks, we've always known TfLTPH take an interest in what we produce as our Stats checker can be used to show certain systems that click onto the blog (in TFL's case, we have a list of terminal ISP addresses). 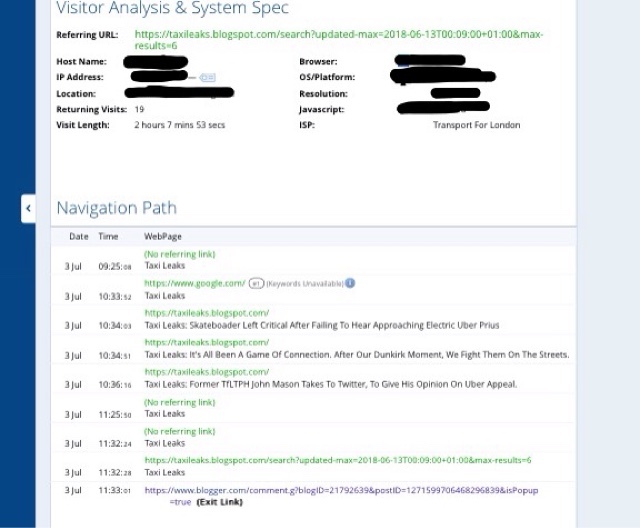 Screen shot from our commercially available Stats Checker program which monitors visitors to Taxi Leaks Blogs. 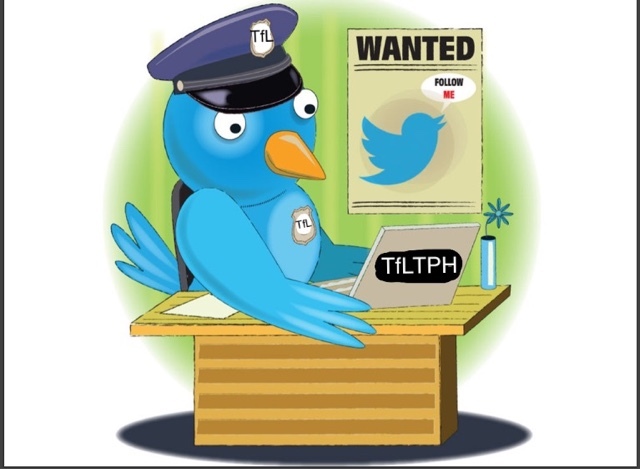 Recently Taxi Leaks have experienced problems when advertising posts on Twitter. We've appealed several times but have had no communication back from Twitter. Our blog has been flag up as unsafe....which is a blatant lie. Will will continue to post using what ever means we have at our disposal as we won't by bullied off line. In the past we've posted proof that the LTDA wi-fi set up at Taxi House, was being used to spread discord amongst drivers from different representative orgs using the comment section of The Old Anderson Shelter Blog. When the proof was published in an issue of the 'United Cabbies News', it suddenly stopped. 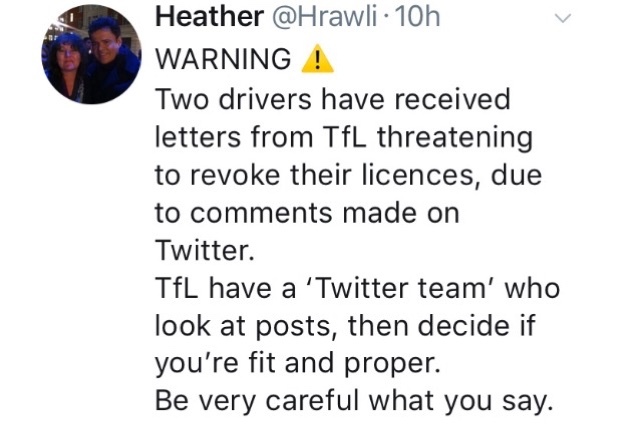 Carrying on from this surveillance, it has been bought to our attention that drivers have started to receive threatening letters from TfLTPH's Twitter Police team, over what's been alleged to have been said on social media. And, it's no good blocking @TfLTPH as we believe their Twitter team are using a number of 'troll type' accounts to follow drivers. So please be very careful what you say on all social media platforms as its alleged they (TfL) have also managed to infiltrate private drivers groups on FaceBook. 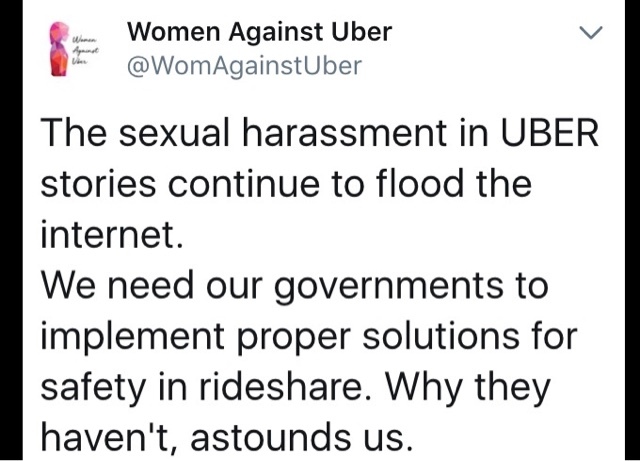 It would be a better use of TfLTPH resources to follow up on Tweets like this one below and take action, rather than what a few cabbies are saying to each other!